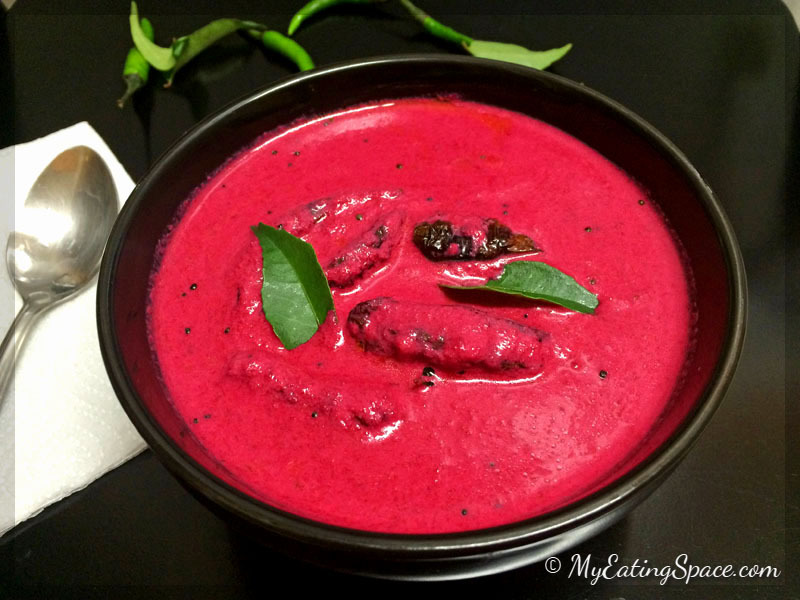 Beetroot Kichadi is the rich colored dish in Onam sadya. It is also one of the easiest dishes to prepare. They are somewhat like a hummus but without chickpea. Beetroot was not my personal favorite actually. I don’t like the distinctive earthy flavor of raw beetroot. I also don’t like the stir-fried beetroot. The only thing I like about beetroot is the rich color that it adds to a dish. Ohh…. there is one more thing I like about this colorful root. They are a bundle full of goodness like fiber, protein, vitamins and minerals. Do you know that beetroot contains a mineral silica, that helps the body to use the calcium thus reducing the risk of osteoporosis? Coming back to beetroot kichadi, this is super simple to make, tastes damn good without the earthy, mineral beetroot flavor (which I like most about the dish) and is highly nutritious with a rich probiotic benefit. 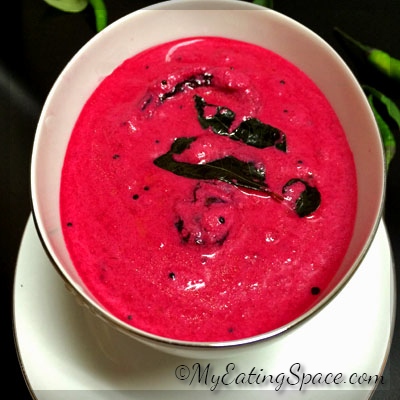 The beetroot kichadi (beetroot sauce) is a mix of coconut, beetroot and yogurt with hot chiles. 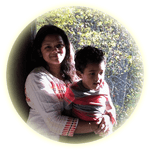 They are a colorful attraction of Onam Sadya. You can also make kichadi with cucumber. I chose beetroot as I can enjoy all the healthy nutrients without the earthy flavor. Do watch the video of making beetroot kichadi/ beetroot sauce. 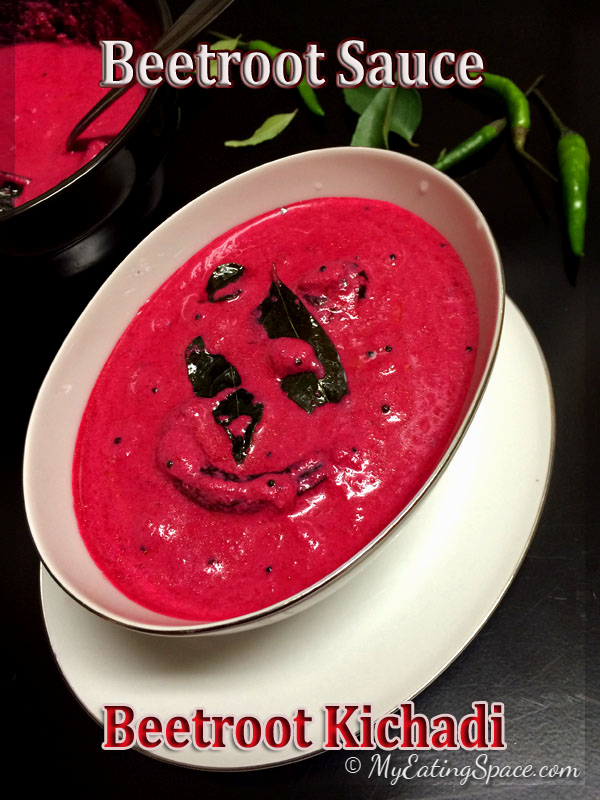 Beetroot Kichadi is a deep colored sauce made with cooked beetroot, coconut and yogurt. They make a rich package of all the vital nutrients and minerals with probiotic benefits. They can also be used as a dip with a slight tangy taste. Steam cook the beetroot pieces on high for 5-7 minutes or until soft. Blend together coconut, water and green chilli in a mixer to make a smooth paste. Transfer it to a bowl. Now blend the cooled beetroot to make a paste. Add yogurt into the coconut paste. Add the beetroot paste and salt into the bowl. Mix well. For tempering, heat oil in a small pan. Tear the dry red chilli and stir-fry in the oil for a few seconds. Add curry leaves. Stir well. Remove from heat and add it to the beetroot-yogurt and coconut mix. Mix well. let it sit for 5 minutes. The sauce will become brighter in color if you keep it for some time. Enjoy a delicious and healthy sauce. This will usually serve a group of 10 people since only a spoon or a dollop of the sauce is served during sadya. The color of the sauce will increase if kept for a while, like a magic. Thanks to the magician; the acidic condition. The acid content in yogurt will make the color of the sauce more bright. Looking back, I don’t know why we stayed enemies for such a long time. I had always got the chance to taste the beetroot kichadi while growing up. But I always walked away, despite all its charm to attract a child. But never again….This wonderful red (or crimson colored?) root will help you make nutrient-rich soups, side dishes and sauces for your family. You will come to know some interesting health benefits of beetroot here.